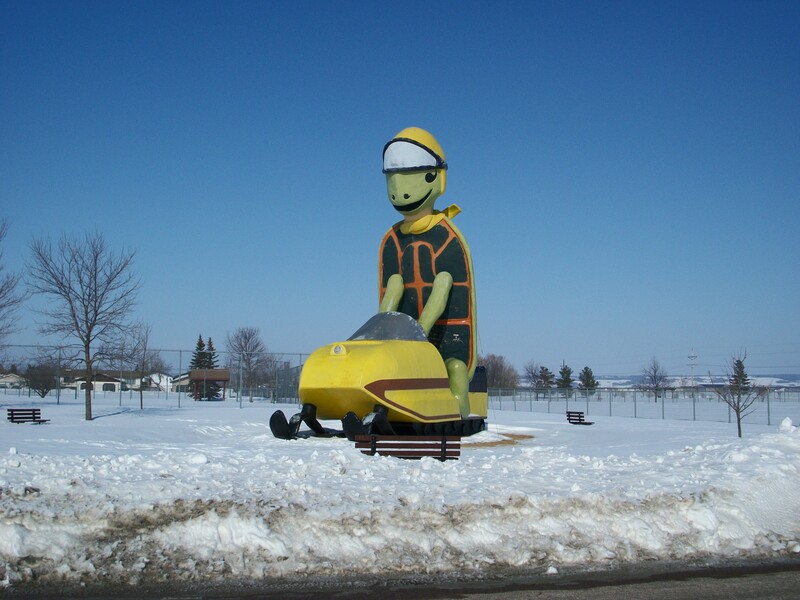 Here in the north-central North Dakota town of Bottineau, on the edge of the Turtle Mountains, sits Tommy Turtle, riding on an old-school snowmobile. One of the all-time classics, this bad boy is worth every second of a trip across the frozen tundra. While in the area: Check out Lake Metigoshe State Park. One of ND’s best kept secrets. The Lake spans across the border into Canada and is accessible from both countries. This wooded, scenic, recreation-friendly lake might make you almost forget you’re in the middle of the Great Plains. This entry was posted in Highway Highlights and tagged ND, Turtle, Turtle Mountains by Seth5544. Bookmark the permalink.